Pope from 1566-1572 and one of the foremost leaders of the Catholic Reformation. Born Antonio Ghislieri in Bosco, Italy, to a poor family, he labored as a shepherd until the age of fourteen and then joined the Dominicans, being ordained in 1528. Called Brother Michele, he studied at Bologna and Genoa, and then taught theology and philosophy for sixteen years before holding the posts of master of novices and prior for several Dominican houses. Named inquisitor for Como and Bergamo, he was so capable in the fulfillment of his office that by 1551, and at the urging of the powerful Cardinal Carafa, he was named by Pope Julius III commissary general of the Inquisition. In 1555, Carafa was elected Pope Paul IV and was responsible for Ghislieri’s swift rise as a bishop of Nepi and Sutri in 1556, cardinal in 1557, and grand inquisitor in 1558. While out of favor for a time under Pope Pius IV who disliked his reputation for excessive zeal, Ghislieri was unanimously elected a pope in succession to Pius on January 7, 1566. As pope, Pius saw his main objective as the continuation of the massive program of reform for the Church, in particular the full implementation of the decrees of the Council of Trent. He published the Roman Catechism, revised the Roman Breviary and the Roman Missal; he also declared Thomas Aquinas a Doctor of the Church, commanded a new edition of the works of Thomas Aquinas, and created a commission to revise the Vulgate. The decrees of Trent were published throughout all Catholic lands including Europe, Asia, Africa, and the New World, and the pontiff insisted on their strict adherence. In 1571, Pius created the Congregation of the Index to give strength to the Church’s resistance to Protestant and heretical writings, and he used the Inquisition to prevent any Protestant ideas from gaining a foot hold in Italy. In dealing with the threat of the Ottoman Turks who were advancing steadily across the Mediterranean, Pius organized a formidable alliance between Venice and Spain, culminating in the Battle of Lepanto, which was a complete and shattering triumph over the Turks attributed to Our Lady’s intercession in answer to the saying of the Rosary all over Catholic Europe. Pius also spurred the reforms of the Church by example. He insisted upon wearing his coarse Dominican robes, even beneath the magnificent vestments worn by the popes, and was wholeheartedly devoted to the religious life. His reign was blemished only by the continuing oppression of the Inquisition; the often brutal treatment of the Jews of Rome; and the ill advised decision to excommunicate Queen Elizabeth I of England in February 1570, an act which also declared her deposed and which only worsened the plight of English Catholics. These were overshadowed in the view of later generations by his contributions to the Catholic Reformation. 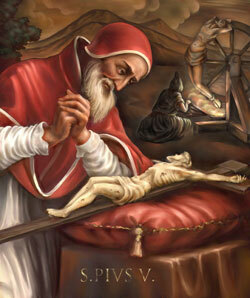 Pope Clement beatified him on May 1, 1672, and Pope Clement XI canonized him on May 22, 1712. 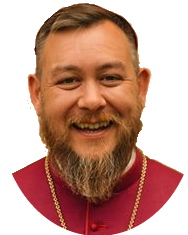 AD MULTOS ANNOS Today is the anniversary of the episcopal consecration of Metropolitan Jerome OSJV, Archbishop of Selsey and Provincial Ordinary for Western [Latin] Rite Orthodoxy in Europe. His Grace was consecrated on this feast day of St Pius V in the year of Our Lord 2012 in the Collegiate Church of St John, Huron University and via his principal consecrator is seventh in direct Apostolic lineage from Archbishop Arnold Harris Mathew (being the first hierarch in Western Rite Orthodoxy, 1911) and eighth from Archbishop Gerardus Gul of the Old Roman Catholic Church of Utrecht. Of your charity please pray for him and the continuance of his ministry among us as he strives to be a “good and faithful servant” of The Lord [cf Matthew 25:23]. Let Thy priests, O Lord, be clothed with justice, and let Thy saints rejoice: for Thy servant David’s sake, turn not away the face of Thy anointed. V. O Lord, remember David, and all his meekness. v. Glory be to the Father and to the Son and to the Holy Ghost, as it was in the beginning, is now and ever shall be, world without end. Amen. Eternal Shepherd, do Thou look favorably upon Thy flock, which we beseech Thee to guard and keep for evermore through the blessed Pius, Supreme Pontiff, whom Thou didst choose to be the chief shepherd of the whole Church. Through Jesus Christ, thy Son our Lord, Who liveth and reigneth with thee, in the unity of the Holy Ghost, ever one God, world without end. R. Amen. O God, thou pastor and ruler of the faithful, look favourably upon thy servant Jerome, whom thou hast been pleased to appoint chief shepherd of the church of Europe. Enable him to further by his example the salvation of those over whom he is placed, so that, with the flock entrusted to his care, he may attain life everlasting. Through the same Jesus Christ, thy Son, Our Lord, Who liveth and reigneth with thee in the unity of the Holy Ghost, God, world without end. R. Amen. Alleluia, alleluia. V. The Lord has sworn an oath there is no retracting: Thou art a priest for ever in the line of Melchisedech. Alleluia. V. The Lord loved him well, and ennobled him; he clothed him about with a robe of honour. Alleluia. Eternal Shepherd, do Thou look favorably upon Thy flock, which we beseech Thee to guard and keep for evermore through the blessed Pius, Supreme Pontiff, whom Thou didst choose to be the chief shepherd of the whole Church.Through Jesus Christ, thy Son our Lord, Who liveth and reigneth with thee, in the unity of the Holy Ghost, ever one God, world without end. R. Amen. Accept, Lord, our peace-offerings. May thy servant Jerome, whom it has pleased thee to appoint as chief shepherd of the church of Europe, enjoy thy constant guidance and protection. Through Jesus Christ, thy Son our Lord, Who liveth and reigneth with thee, in the unity of the Holy Ghost, ever one God, world without end. Since Thy Church has been nourished by the sacred repast, govern her in Thy clemency, we beseech Thee, O Lord, so that under the guidance of Thy mighty rule she may enjoy greater freedom and abiding integrity of religion. Through Jesus Christ, thy Son our Lord, Who liveth and reigneth with thee, in the unity of the Holy Ghost, ever one God, world without end. R. Amen. May our partaking of this divine sacrament protect us, Lord, and may it ever defend and save thy servant Jerome, whom thou hast been pleased to appoint as chief shepherd of the church of Europe, together with the flock entrusted to his care. Through the same Jesus Christ, thy Son, Our Lord, Who liveth and reigneth with thee in the unity of the Holy Ghost, God, world without end. R. Amen.